Back in April my first impression of the Iokath storyline was that it was "okay": It had some good pieces of dialogue, but felt lacklustre overall. When I finally replayed it this past weekend, the latter aspect stood out to me much more this time, and I wanted to write down some thoughts on it. In case you couldn't guess: that means that this post will contain spoilers for Iokath. The thing I already criticised back in April was that the whole "superweapon" shtick doesn't make much sense because absolutely nothing seems to be known about it. I could understand the factions chasing after something they knew to be powerful, but it doesn't make sense that they all charged in full force based on nothing more than an anonymous tip-off that there was a superweapon of some sort, oh, right over there, somewhere. It's not like vague, anonymous tip-offs are ever wrong or even a setup for a trap, right? I'm also not convinced the connection to the operation was done in the best possible way. Personally I don't mind story tie-ins, and I've had comments on this blog from people who described having experienced them as positive in the past, e.g. because the Oricon quest to do Dread Fortress introduced them to raiding and they actually found it quite fun. But the way it was done here just felt kind of lacklustre - after all the fuss about superweapons, are the gods from the machine important now or not? Pretty much the moment Iokath was released I saw people freak out on Twitter about stupid Bioware "forcing" them to raid in order to see the story, but there is no story in there right now. The mission from the Scions just tells you to enter the operation, and that's it. You kill some bosses and leave again. Maybe it will make more sense once the whole thing has been released. But if there is supposed to be some sort of story thread to the operation as well, then the piecemeal release of the bosses certainly hasn't helped it. 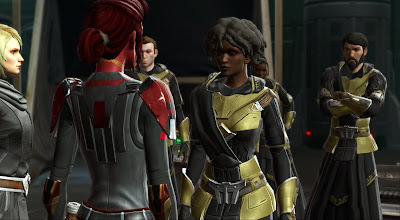 However, my biggest issue with Iokath is the treatment of Malcolm and Acina. Here we finally have a reason to split the story into two different versions for the Republic and the Empire again... and they play out pretty much identical regardless of which faction you side with. We've come a long way (and not in a good direction) since Shadow of Revan, when Bioware first unified the story for both factions but at least still tried to mix things up by making the cut scenes and dialogue for each one play out slightly differently. Worse, two strong and important NPCs are killed off without much fanfare (well, one of them is, depending on your choice) - it's like Darth Malgus all over again. Despite of my strong affiliation with the Republic, Jace Malcolm is the one whose (potential) death I'm less hung up about. We never really got to know him very well in game, so it just feels like a bit of a waste, but at the same time his actions don't exactly feel "wrong" because we didn't have enough points of comparison for how he should be acting. And while his loss must surely be a blow to the Republic, at the end of the day he's "just" a soldier and will be replaced. Now, Darth Acina on the other hand... I feel the story just did her a grave injustice here. The whole Outlander arc made it pretty clear that she managed to survive and even seize power when so many other Sith died or scattered due to being a cautious opportunist who was able to swallow her pride when needed. The whole of KotET chapter two is about how she stands for a slightly different (more humble and quiet) kind of Sith, and while out in the jungle she talks about how she never really gets to go out and into the thick of things because she has to stay behind and steer things from the safety of the shadows. So why in the world does she have to go to Iokath personally when she already has capable people on the ground and doing the work for her? Why does she have to spearhead the crucial attack herself and risk her life by linking up with a piece of dangerous alien technology? I suppose you can't rule out that she had a sudden lapse of judgement, but it just feels so out of character. And of course what's supposed to happen if the Empress of the Sith is suddenly dead? You can't tell me that the power vacuum created by such an event isn't going to change the way the Sith Empire is run going forward. There is a certain irony here: People have often complained that the choices we get to make in the story don't feel meaningful, but here we have one that should by all means be extremely meaningful... but it's made in such an off-hand way that it's pretty impossible to imagine Bioware having fully accounted for believable consequences. All in all, I'm left with a lot of uncertainty about how the story is going to continue going forward. I was initially really hyped about the idea of getting to return to the Republic/Empire conflict, because to me that's part of what Star Wars is all about - I never felt as attached to Zakuul and the Alliance. But the current setup doesn't give me anything to look forward to. At least on Iokath, Republic and Empire continue to be treated as playing second fiddle to the Alliance, and are portrayed as uninteresting and same-y. Where's the fun in that? I suppose the Alliance will remain the main issue going forward. If it was up to me, I'd be happy for it to be disbanded, with my characters just returning to their old factions and helping them rebuild. But I realise that many players feel differently and this direction would be a very hard sell for them. After being commander of a whole faction, why would you just give that up? And you can bet that if Bioware makes us somehow lose the Alliance, enforcing a story direction that causes it to fall apart, there will be hell to pay. It kinda feels like they've manoeuvred themselves into a corner, and I'm curious how they will try to get out of it, but also worried that it will be unpleasant in some way. My main complaint about the end of KotET was that there's nowhere to go, story-wise, for the Outlander. You're basically the ruler/protector of the Galaxy. The only way to move up is to deal with an extra-galactic invasion. That said, the effects of the decisions on Iokath feels like Bioware wants to have events spin out of control to where you lose everything (again) and, perhaps, try to rebuild something in the midsts of utter chaos. If the Galaxy completely collapses that would certainly get them plenty of room to change things. With the movie coming out in December I'm sure we'll see a new story heavy expansion at that time. I just hope it will be more group friendly for the story bits. True, the shake-ups would be a lot, but given the backgrounds of Kotor 1 & 2 it wouldn't be out of character. They could even point out resemblances to that earlier era. Too bad they removed Saresh from the game. She would have allowed them to keep up the Republic/Empire tension. Brilliant summary of the issues with this installment. I, too, felt these two important characters were cast off like any other story mob. Why bring Jace back for this? Now he's not available to be in any more story. And Acina's past actions and compromise, her potential are discarded without any consideration of her service and sacrifice. I agree that disservice was done to both. Until the rest of the story pans out I'm hesitant to say much more about my overall thoughts,because we may get some resolution (i have never read a spoiler, just hoping) but I can agree with your frustration here. I, too, am holding out hope for a resolution obviously! I just find the current story direction a bit concerning. As I said in my own post on the matter back in April, it doesn't help matters that at this point in time Acina was the only known high-profile Imperial who wasn't either absolutely or potentially deceased or a returning Companion. They wrote the story in such a way that they needed someone who they could sacrifice and still be meaningful, and Acina was sadly the only Imperial they could have used, despite having previously-established that of course she wouldn't be the sort of individual to do this. Also bonus points for her potentially being stabbed in the back by the Alliance Commander who had previously allied with her, having stated in Chapter II that this was a common tendency among the Sith on the front lines and thus implying that she was hoping that the Alliance would be different. Additionally, Malcom isn't anywhere close to her 'equal' on the playing-field. We don't know who Malcom's equivalent is at the moment, but Acina's equivalent is Supreme Chancellor Madon. Whilst I could see Saresh being on-the-front-lines, I honestly hope that Madon is as different to her as Acina is/was compared to the stereotypical Sith. It would definitely have been better if they'd have reintroduced somebody like Darth Ravage or Mortis and made them the Imperial Commander on Iokath. Somebody who the 'audience' would have had a history with, someone who had potentially been near the front lines before (Ravage on Ilum, for example), and somebody who ultimately doesn't matter in the grand scope of things. Plus, it would allow for some Classes to have a 'vanilla story' connection; Troopers are connected to Jace thanks to Havoc Squad whilst every Republic Class has the potential to meet him in the Alderaan Bonus Series, while Warriors and Inquisitors get to know (and hate) Ravage in their Chapter 3 endquest and every Imperial Class meets him during the story for the Ilum Flashpoints. Acina, being introduced in the Seeker Droid questline in 2.0, doesn't have anything close to such a connection. The main problem has still come into existence because there are just so very few pre-existing important Imperial characters that they could have used thanks to the vanilla story just killing so many of them off on both sides. Since some of them (although it's never specified who) went along with Baras's claim to be Voice of the Emperor - either for their own gain or because they believed it - I can sorta see some members being willing to support Acina if they get something out of it. Basically, it's a nasty corner which they wrote themselves into and aren't managing to climb out of in any satisfactory manner. They painted themselves into a very nasty corner by going Over The Top Epic with the KotFE/KotET storylines. If the Alliance had been, basically, the anti-Revanites (as it was in SoR) and remained a mostly underground organization, in opposition to a remnant and opposed band of Vitiate Loyalists (or even an "Empire" of Zakuul that is only necessarily powerful enough to fight an underground Alliance, while the Official Republic and Empire gutted each other in all-out war and continue to hamper each other's attempts at rebuilding, you can tell substantially the same story, toned down enough that you don't need to have the protagonist be Omnipotent In The Force (simply depower Vitiate/Valkorian and his family to, say, the level of the Force Using PCs; who are still among the most powerful Force Users active in the Galaxy. The Alliance War then becomes a "war" of shadows and conspiracies in the backstory as well as in the parts the PC plays, and the hunger for the rumored superweapon makes more sense, as the two OG sides are so evenly matched and battered that even the most minor of advantages throws the scales out of balance. I remember over leveling on purpose so I would have a speeder in 1.x by Tatooine. Then I would blow threw just my class quests until I was four levels under the planet because I would get more XP from the yellow and red quests. I did manage to finish Corellia at lvl 46 on my Jug and the final fight took me many tries to win. It was kinda fun to have that challenge. It is almost too easy to over level for a planet now but I do understand why. I do not need to see a the same planet quests on four different characters. I liked the fact that you could mix in FP's and a little PvP and still not over level your planet. 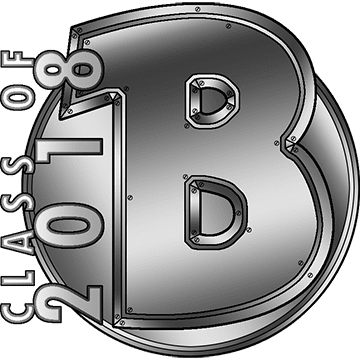 I did stink if you did a lot of PvP and flashpionts then you realize that you should finish chapter 2 to get your class buff. Getting no exp from mobs and only 5 XP for grey quests. I had a different"game" for leveling recently, I tried to collect the armor for each planet. I'd you do the story plus the planetary arc you will earn the full armor for that plant. I am up to Makeb on my slinger with 16 outfits only missing Coruscant.